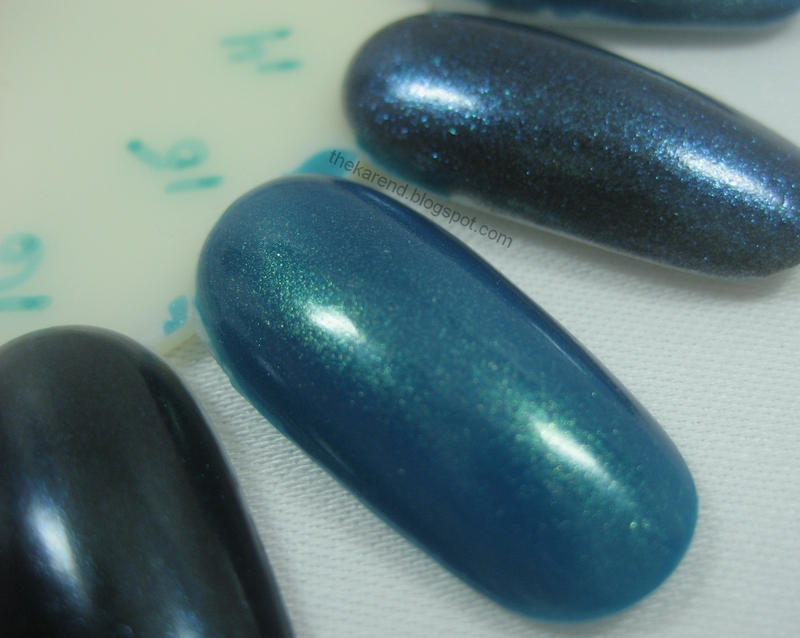 As I was choosing and editing the photos for this installment of Nail Wheel Wednesday, I saw that a lot of these polishes on a supposedly teal wheel are really blue. Ah well, things happen. 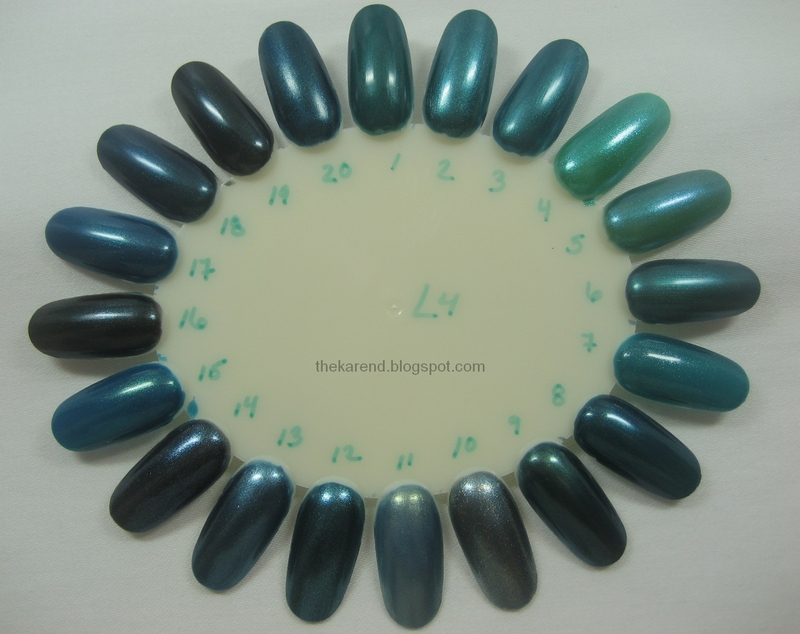 Before I get to the nail stuff today, I must say the last week or so has been crazy stressful for me. Mr. K and I were on vacation in Idaho (yep, more skiing, with me trying to do some work in the evenings since there's a huge crunch at the office and if I were a better employee I would have cancelled my trip). A few days in, I got a call that my mom was back in the hospital with an unclear diagnosis but possibly another stroke and definitely issues with her heart, lung, and kidneys. I didn't have a return plane ticket because this trip was the one when we were going to drive our truck back home after having it out there all winter. I looked at fares for a flight into Chicago, but they were so very expensive (if I were a better daughter would I have just sucked it up and paid?) that we decided to just start our drive earlier than planned. On our way back, my phone died and nothing I knew how to do helped. I used Mr. K's phone to call Verizon stores along our route (not that there are many in South Dakota). The guys at Batteries Plus in Sioux Falls did have a battery that would fit, but that didn't help. I went to the Verizon store nearby and the woman there was pretty much anti-helpful—she started trouble shooting it, but once she looked up my record and saw it was a business phone, her attitude changed and she seemed to think I had driven to South Dakota specifically to scam Verizon out of a replacement phone. She refused to talk to the Account Manager for our company contract and was completely unsympathetic to the fact that I was concerned about missing updates from relatives on my mom's condition. I thought about trying again at a different Verizon store farther down the road (maybe in Minnesota they'd be nicer?) but decided I'd rather not waste any more time that I could be spending driving to get to Mom. When we did get to the hospital, the second or third thing out of my mom's mouth was "did you get my message?" Augh. The damage to her brain means she can't always come up with my name, but she remembered my cell number. I was relieved to find her in amazingly good spirits despite her weakness and pain. She was stable enough that I felt okay coming home to Michigan for a few days; I'll be heading back to Illinois later this week. Mom will likely move to a rehab facility at some point and after that, we'll see. 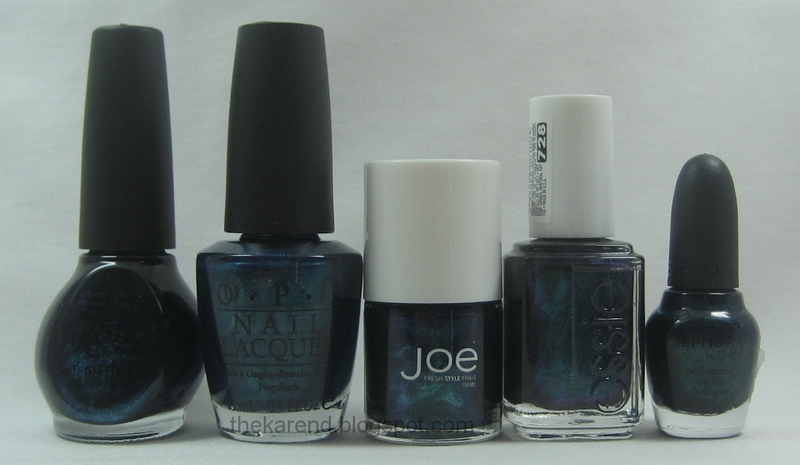 Anyway, on to the nails. Just a quickie today, from a brand I'd never heard of before: Tami. I got it from a sweet lady on MakeupAlley. 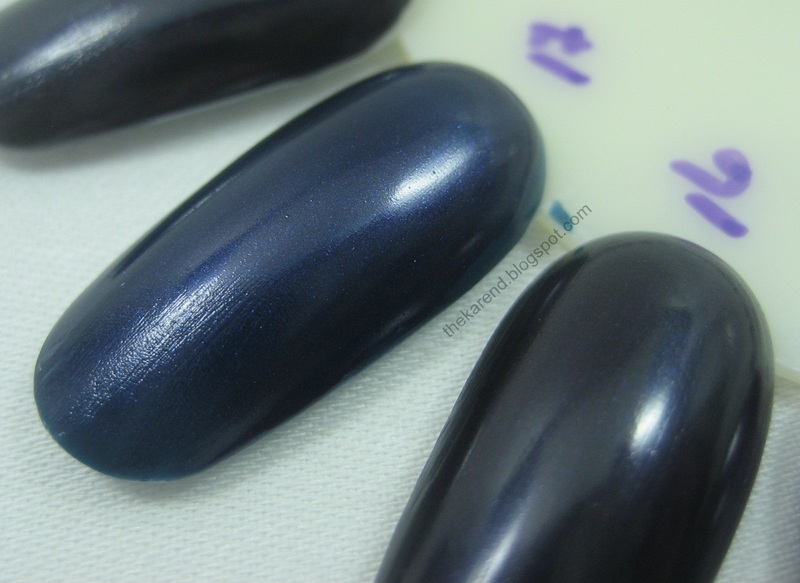 She had one of the old Sally Hansens that I love and offered it to me; when it arrived, it was not alone, but part of a wonderful fun package that included Tami Onyx, a very pigmented black creme. 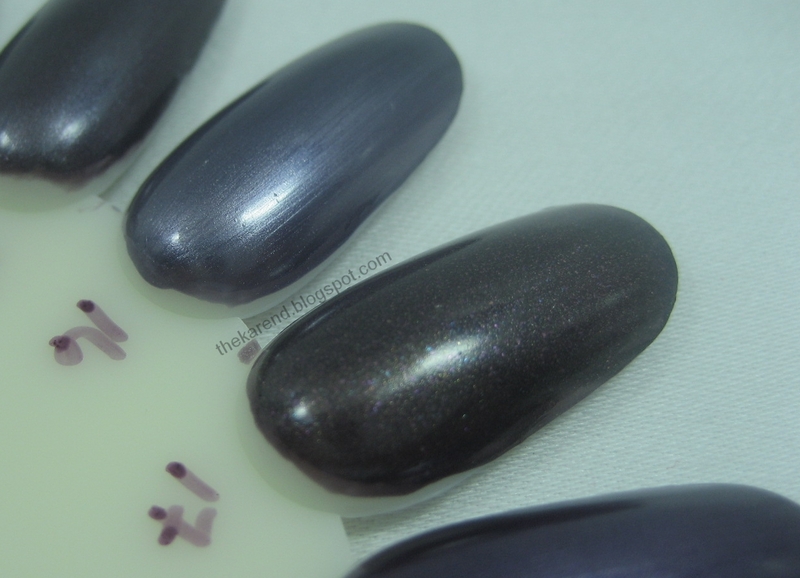 One coat would probably have been fine but I did two because I couldn't quite believe one would be enough. 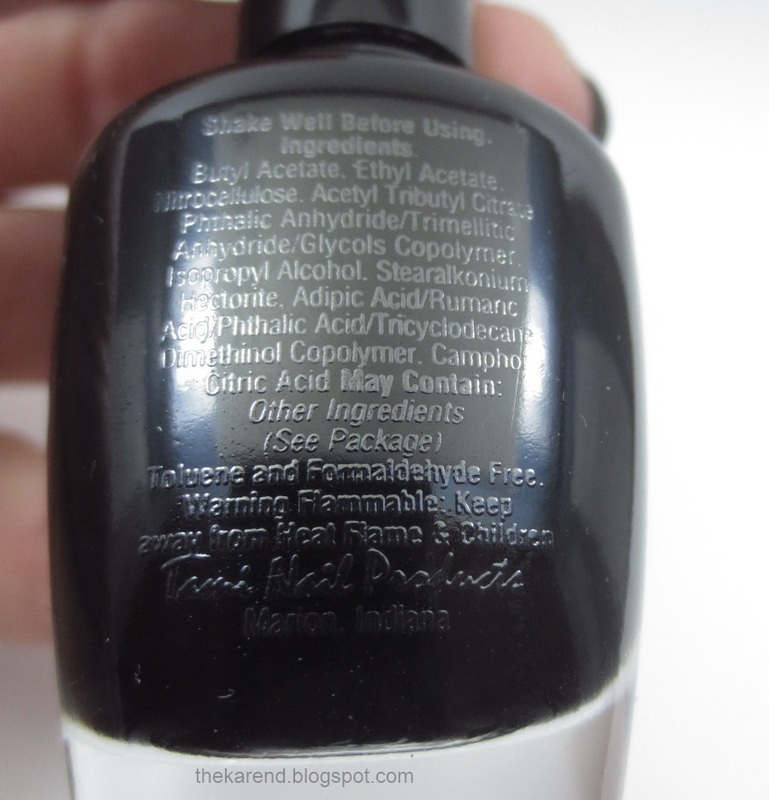 The back of the bottle shows that the brand was based in Marion, Indiana. I say "was" because I understand they're out of business now, which is too bad since that means this might be the only bottle I ever get from them. I'm likely to be even more inconsistent about posting over the next few weeks than I was already going to be but at some point things will settle down. I did get a new phone today, so that's a good thing. It's bigger than the old one, so maybe I'll start reading and commenting on blogs on the go since I won't have to squint so much at them, which might help me not get so far behind all the time. 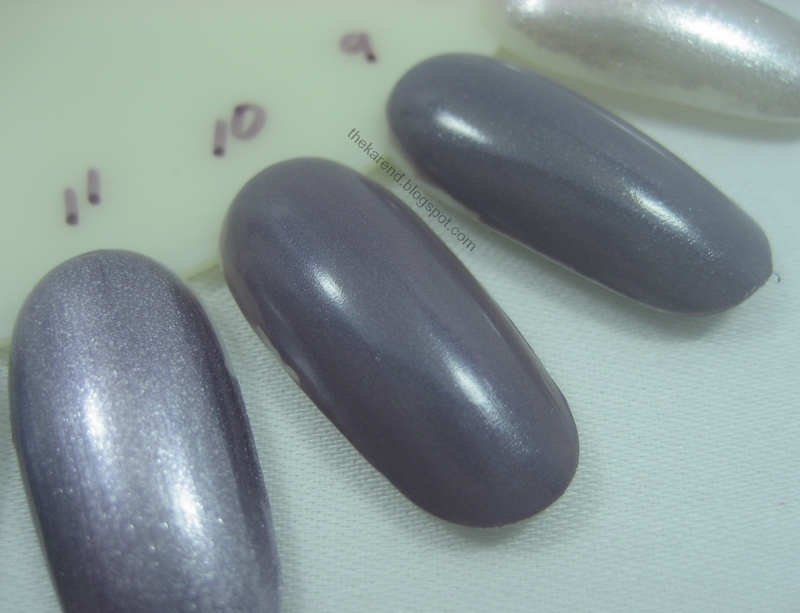 Today for Nail Wheel Wednesday I've got purple shimmers from the greyed out, subdued side of the tracks. They're purple, but they're not all up in your face about it. 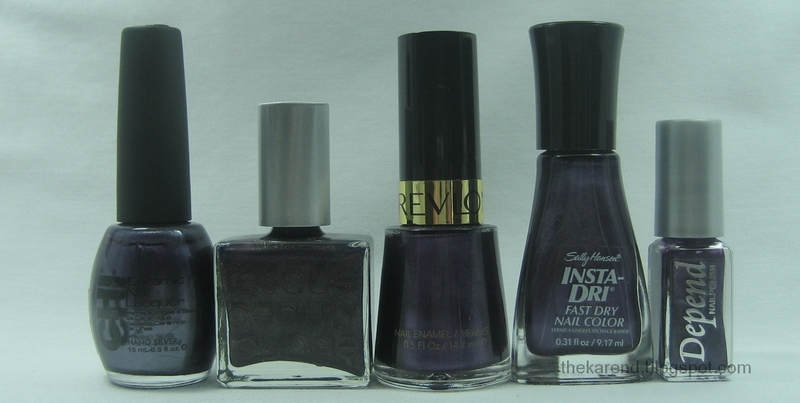 When my CVS put the Smooth and Perfect Line on clearance, I grabbed some of the colors I hadn't tried yet even though the first two I got weren't exciting enough for me to have bought any more in the year since I posted about them. 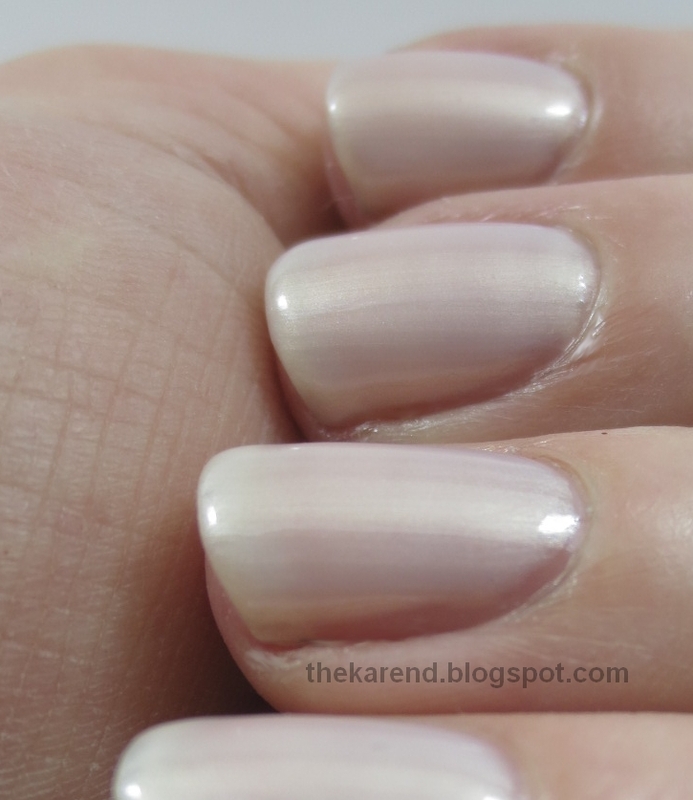 When I wanted a quiet nail look a couple weeks back, I turned to Linen, a very pale peachy pink shimmer. 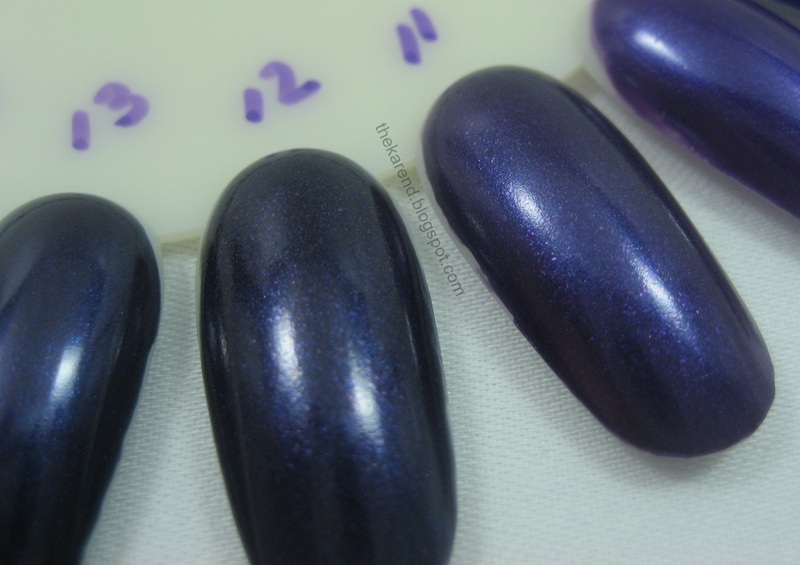 This was a bit thicker than the other two I'd tried in this line, and I only used two coats of Linen rather than the three I was expecting to need based on past experience with Smooth and Perfect. 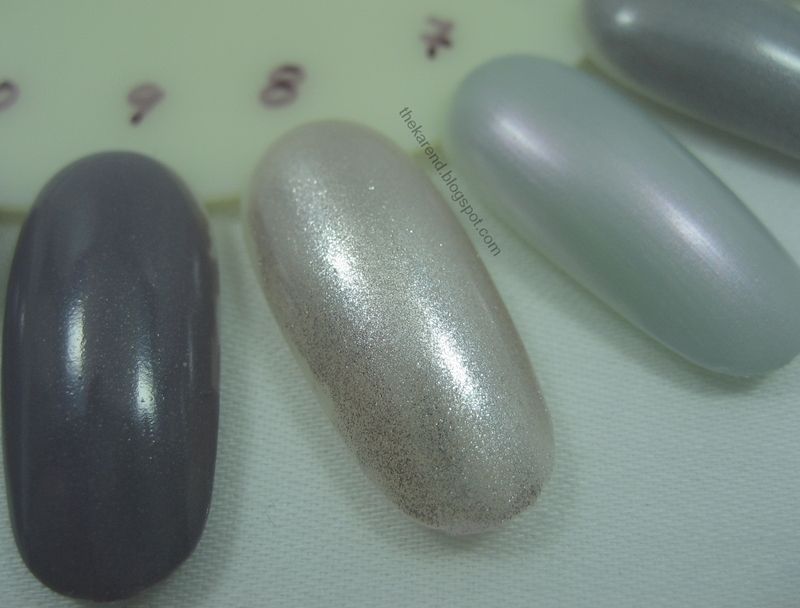 I used Barielle Fortifying Nail Builder as a base and Diamond Dry topcoat, which Sally Beauty got me to try by giving it away free with some purchase or another. 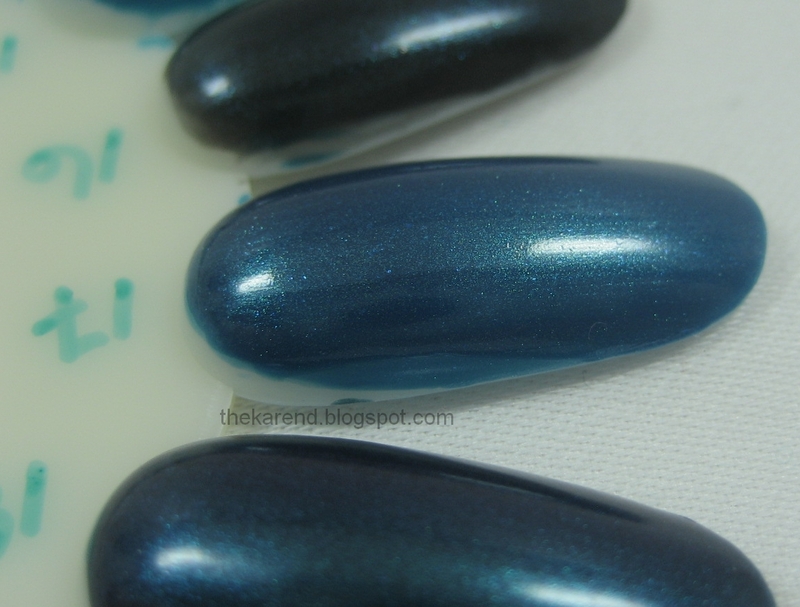 This did achieve my goal of having quiet, non-distracting nails, but I really wish I'd added Glass Slipper to it like I did with the two Smooth and Perfect I'd swatched last year, as it was so quiet I got bored looking at it. 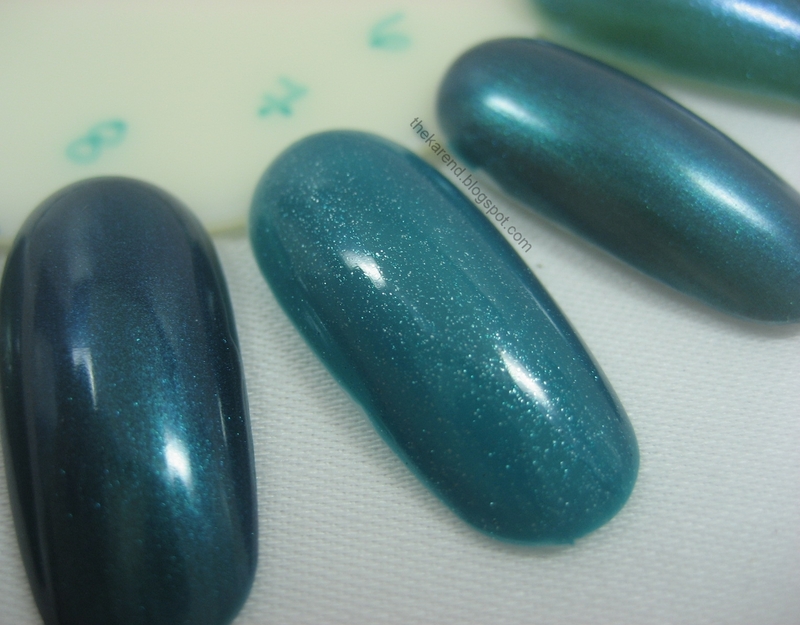 The Diamond Dry topcoat did work very nicely for me, drying quickly and not chipping, so I will be using that again. My schedule the next few weeks is more packed than usual, so I probably won't be posting as often as usual. Or maybe I'll use writing posts as an escape from thinking about all the other things and will post anyway. We'll see. 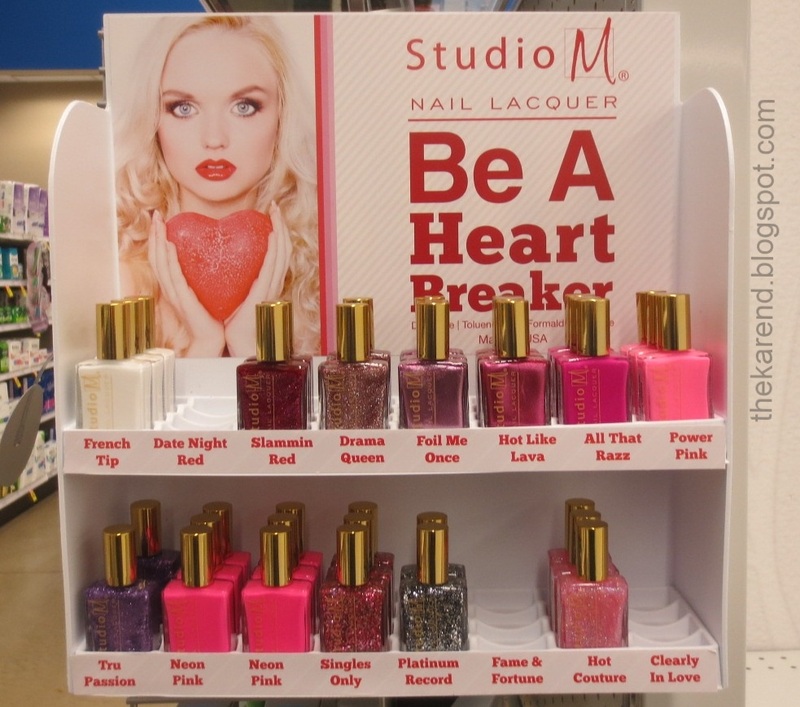 To celebrate the holiday, I've got a selection of colors from this year's Studio M Valentine's display, Be A Heart Breaker. 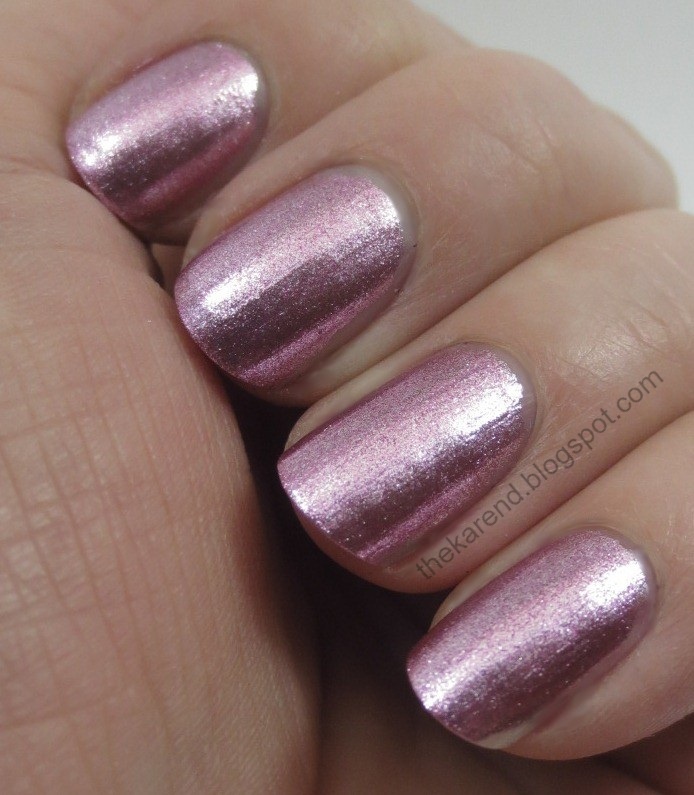 Foil Me Once is a silvery pink foil finish shimmer, which I first remember seeing in the Valentine's display for 2012, then it showed up as part of the Christmas 2012 display as well. 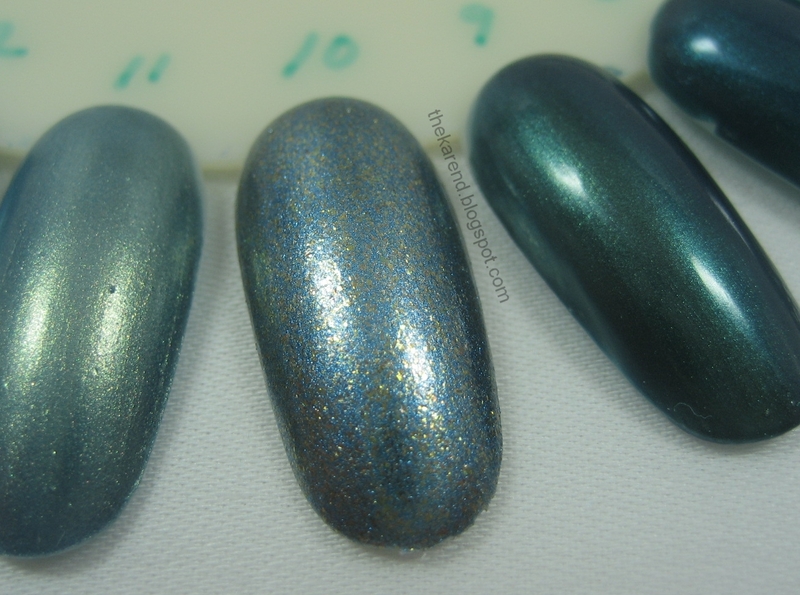 I used two coats, no topcoat, for these swatches. 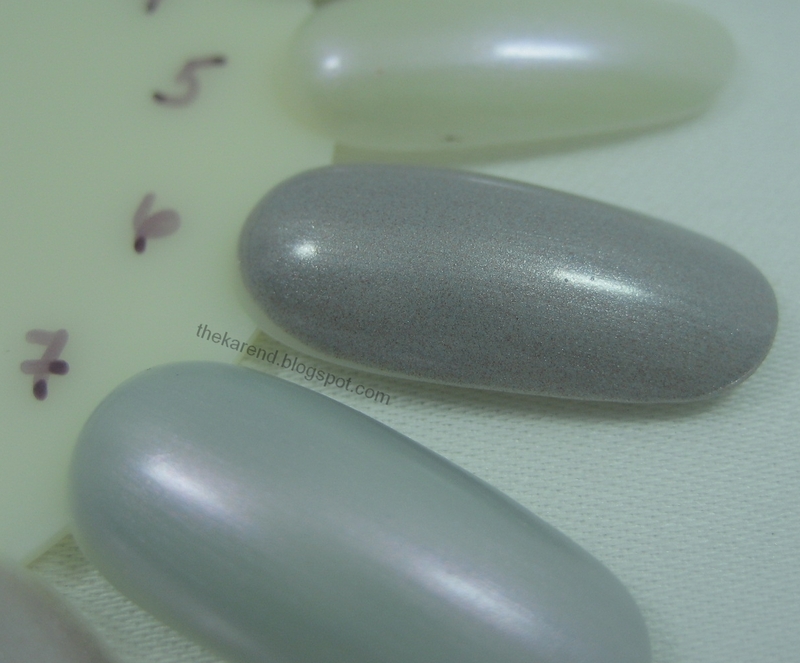 I topped Foil Me Once with Platinum Record, a mix of silver and pewter glitter in various sizes in an almost clear grey base. 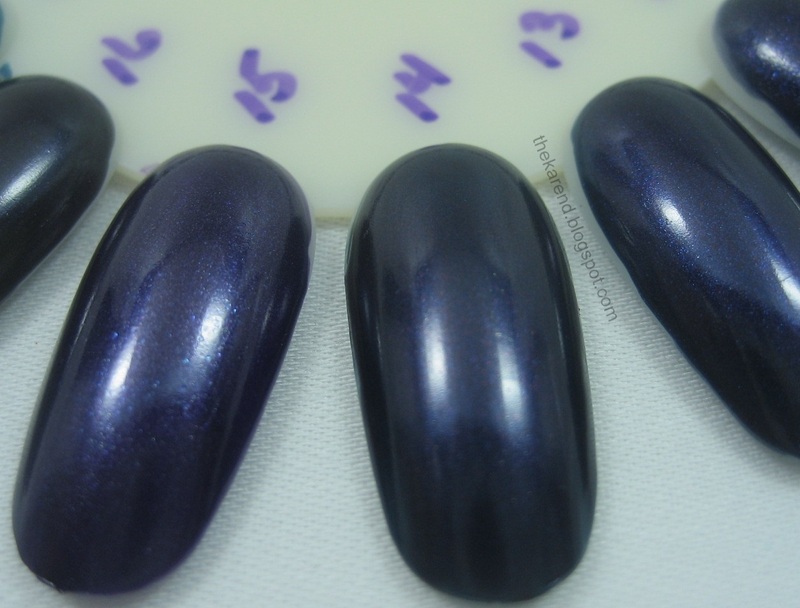 This is the first time I've seen it in the Studio M line, but it looks to be the same as Color Club Platinum Record from their 2011 Fame & Fortune collection (both brands come from the same corporate parent). 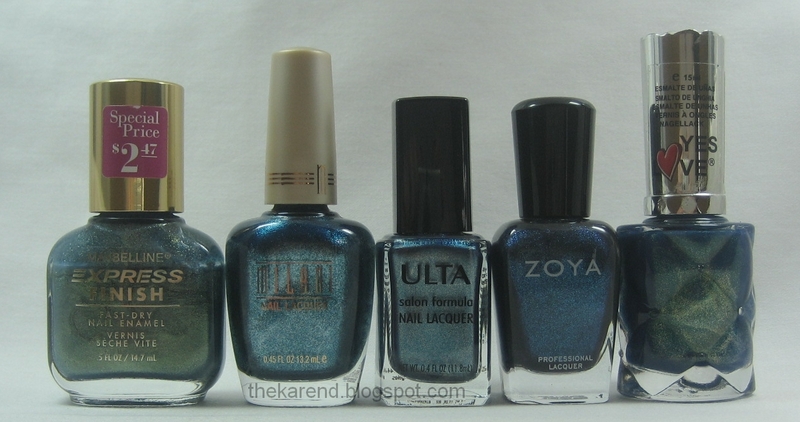 I used two coats of Platinum Record plus topcoat over Foil Me Once for these swatches. 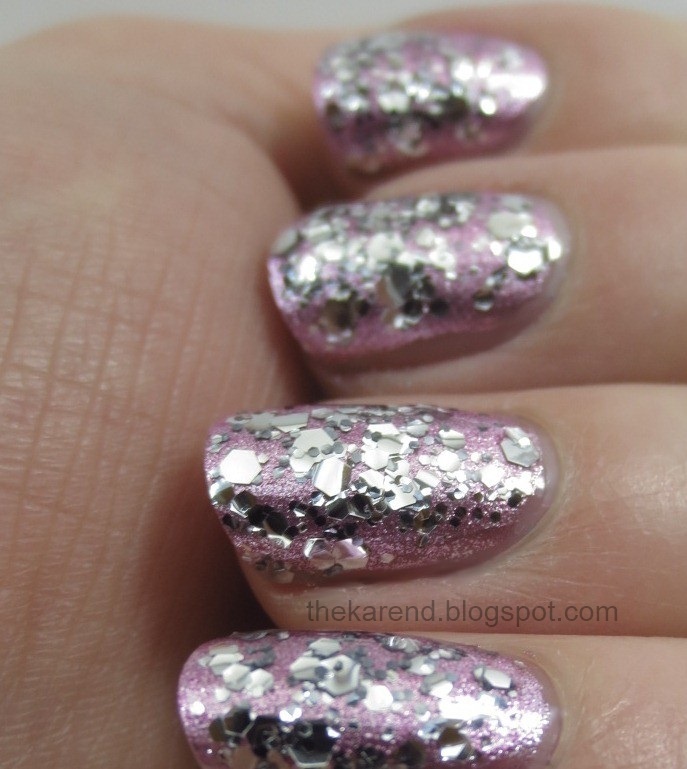 If I were wearing this as a full mani, I would have added another layer of topcoat to smooth it out a bit more. 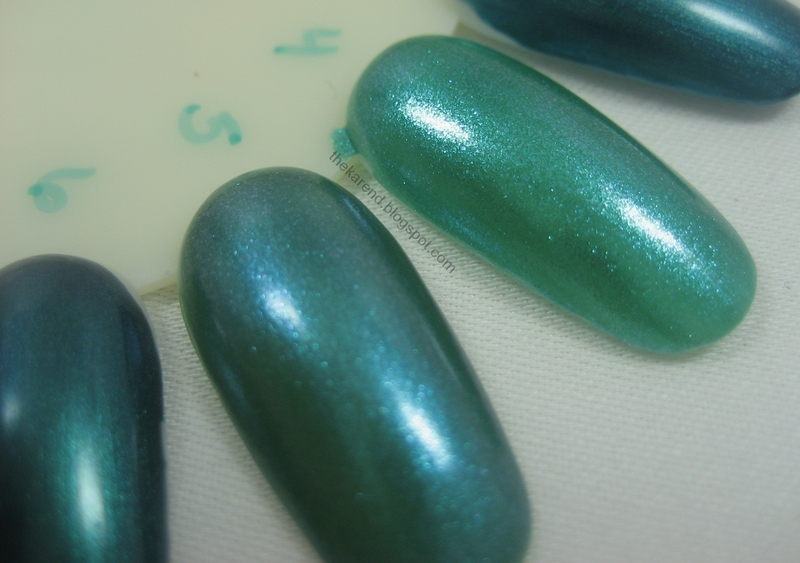 The glitter was pretty flat, no curling that I could see, but there's still a lot of it and where the pieces pile up on each other there is some bumpiness. Power Pink is a neon pink creme that shows up in the seasonal displays sometimes (this one and last summer's On the Bright Side, to name two) but is pretty much always available in the core section. 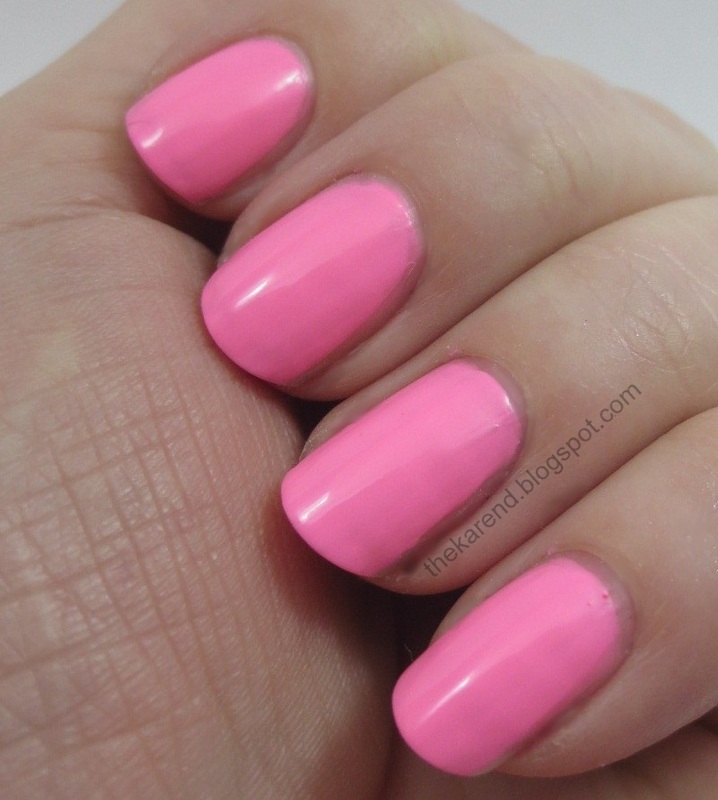 Because it is a neon, it benefits from being layered over a white base, but I was lazy and didn't use underwear, instead putting on three coats of Power Pink by itself. 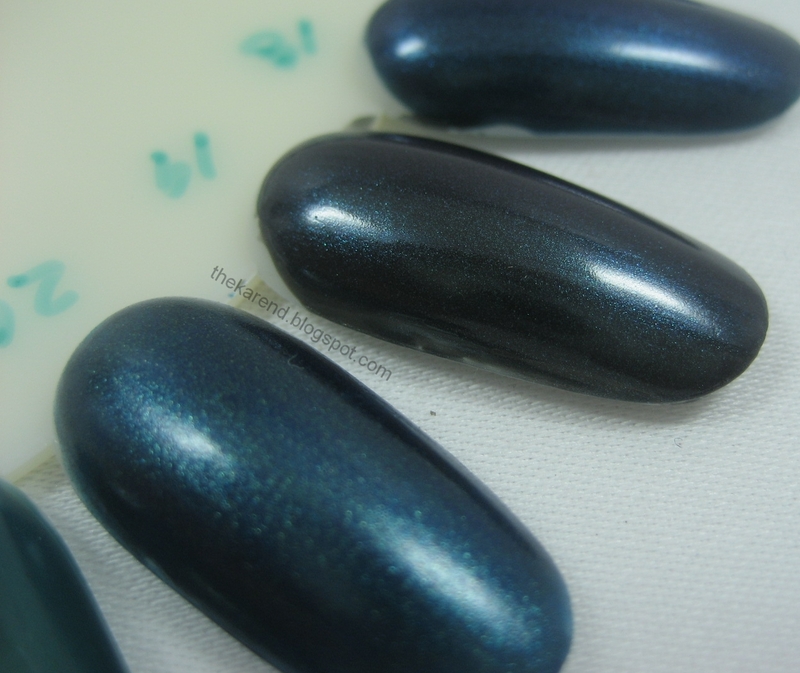 I doesn't dry quite as matte as some neons, but you'd definitely need topcoat to make it shiny. 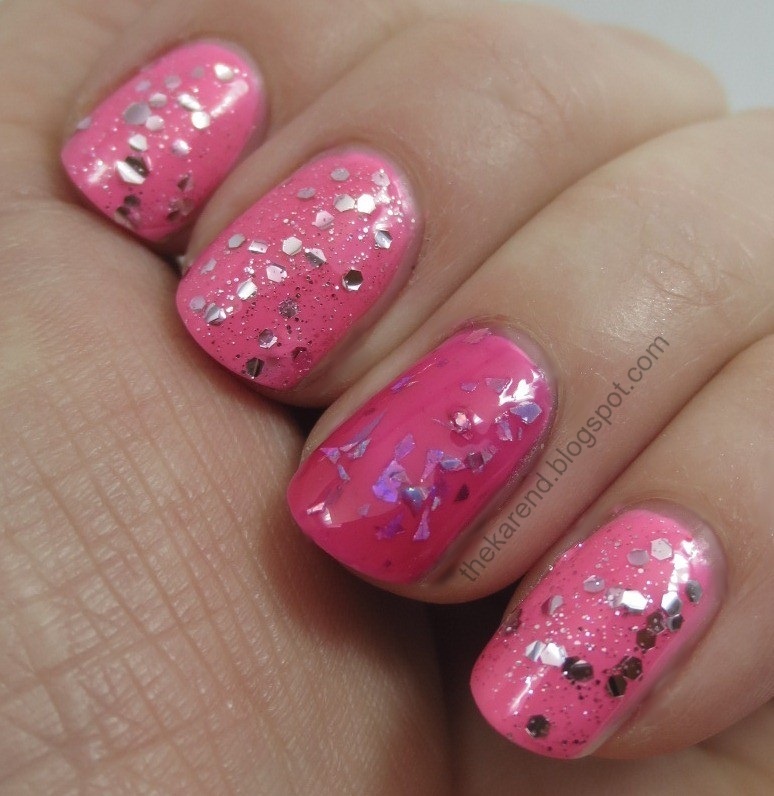 Over Power Pink, I used two chunky layering polishes. 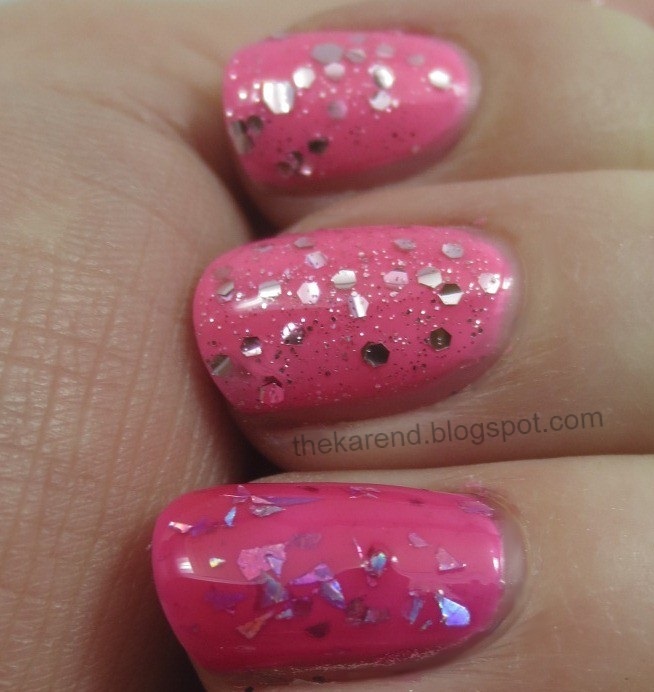 Singles Only has a similar glitter mix to Platinum Record, but the base is a sheer pink. I've not seen this one before, either in Studio M or Color Club. 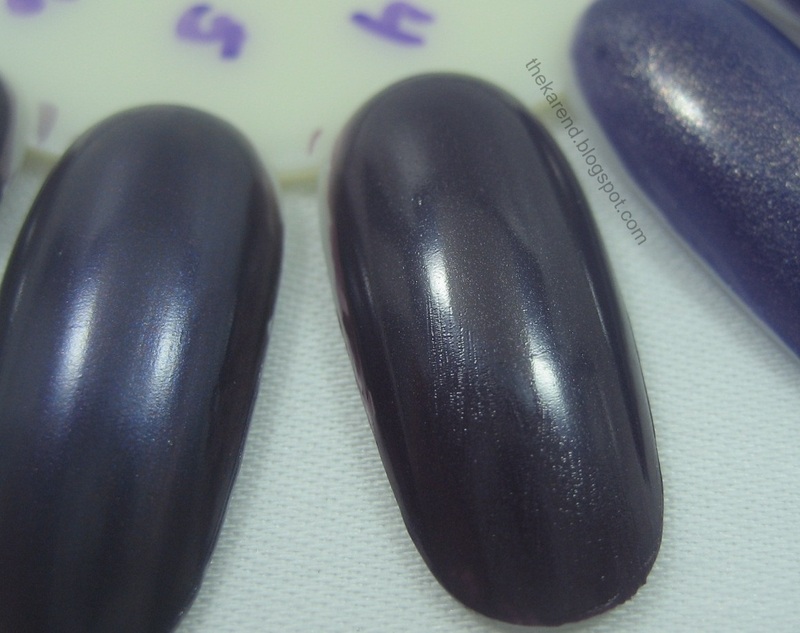 For an accent nail, I used Fame & Fortune, another Color Club Backstage Pass rebottle. 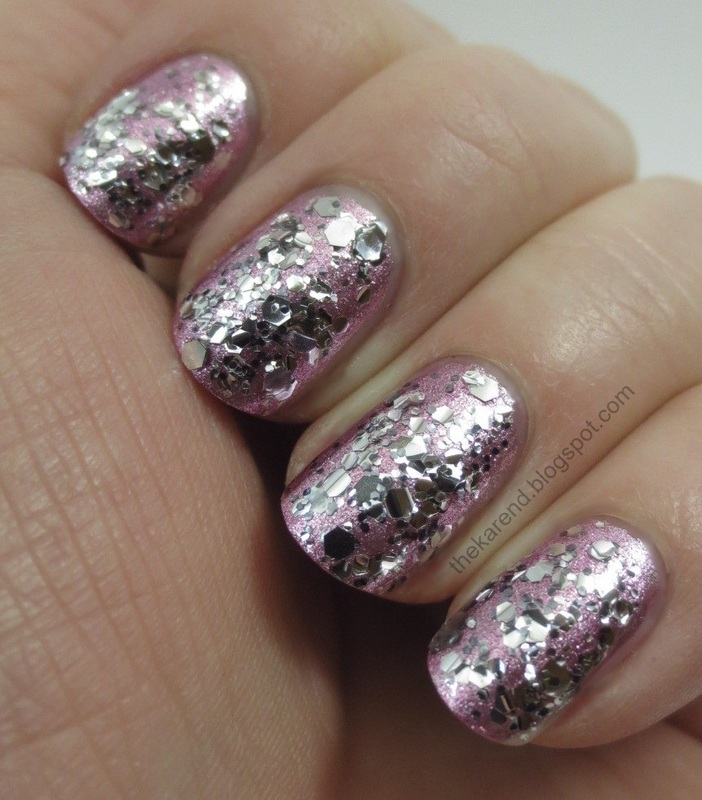 This has shredded silver holographic glitter pieces in a sheer berry red base. I first saw it in a Studio M bottle in 2012's Valentine display. 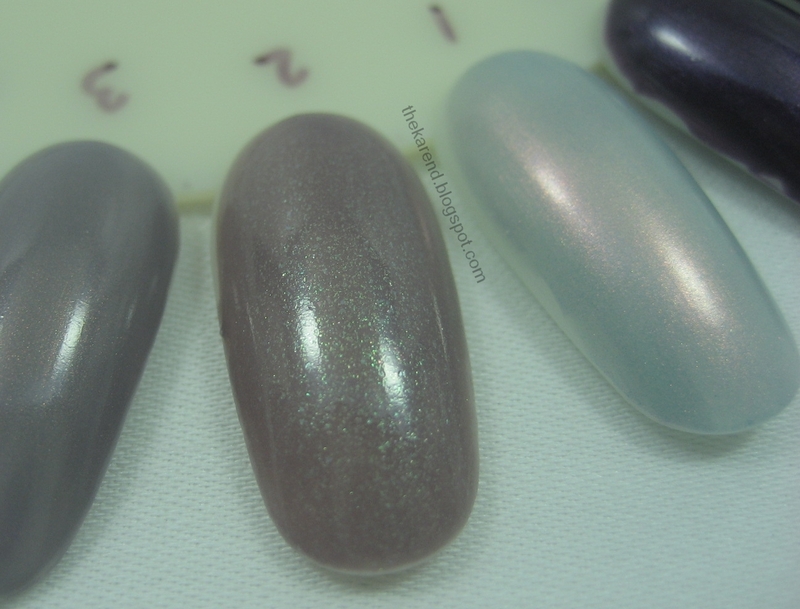 I used two coats of each of these over the Power Pink and used topcoat on Singles Only but none on Fame & Fortune. 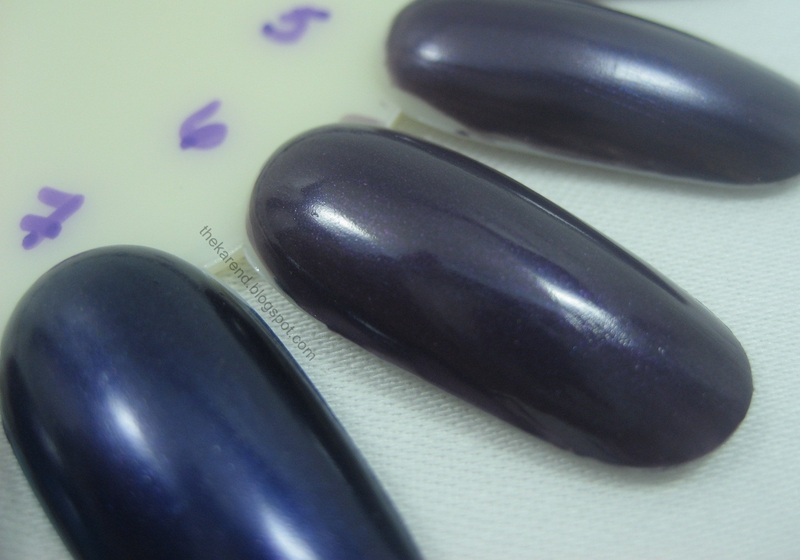 You can see how Fame & Fortune has a deeper base color. Here they all are lined up. Remember to let me know in the comments if you want a chance at getting these in your stash. I'll leave the comments open for at least a week, and non-US ladies are welcome. UPDATE 05-Mar-2013: I finally drew a winner for these; it's Meredith Anne from Polish and Charms. 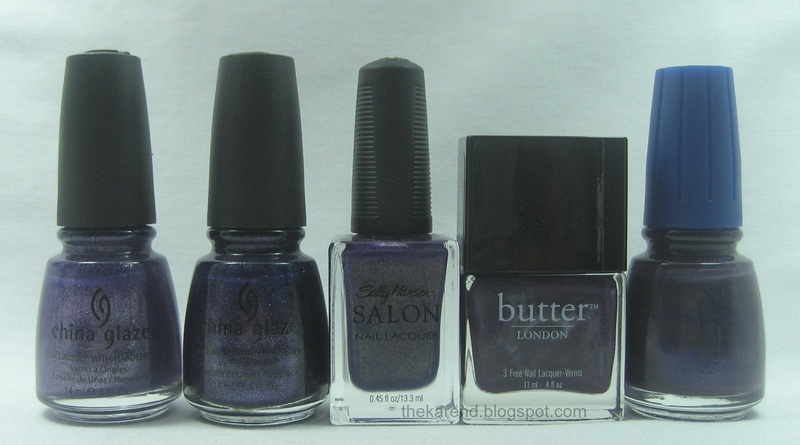 I wasn't sure this post should be called "purple shimmers". 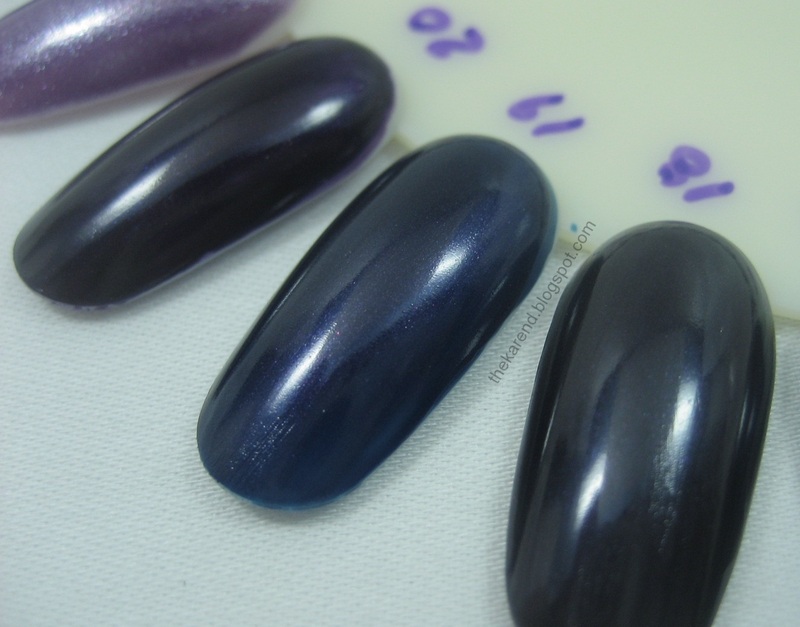 Most of the polishes on this wheel are that, sure, but there are some that are very nearly blue and some that are so dark they might as well be black. I'm not happy with the quality of the detail shots on this wheel; I'm guessing I was rushing both during the painting as well as the photography, as I see some scratches/brush marks on some of the tips that wouldn't be there if I was paying attention. I'd like to redo them, but if I started down that road, I'd likely never finish this wheel swatching project.